1. Techniques – I need to know what to teach and how. 2. Concepts – I need to know the bigger picture behind why I teach these concepts. 3. Territory – I need to understand the material my teaching affects, like the human body in general, or its relevance to the unique individuals and communities I share it with. This is the who. Let me give you an example using content I specifically teach – teacher trainings, anatomy & biomechanics workshops and movement classes and workshops. These are the skills – the what – I impart to my students and how I impart them. For teacher training, this might include helping a teacher refine an unclear cue in bridge pose. For teaching movement it might include how to transition from one position in space to another, like going from constructive rest to bridge pose by way of hip extension instead of spinal extension. Techniques are actionable and applied specifically. They are also the easiest to learn initially. You can simply observe someone apply a technique and then mimic it. However, to master techniques (to refine your teaching ‘how’) can take years. Finally, techniques are important because without them, we literally have nothing to teach! Or, here I’m mid-way through demonstrating a technique for entering into Half Moon Pose using a resistance band. This is my ability to hold all of the techniques I have in my mind and then to know how to put them together and why I’d put them together for a particular outcome. This is the why of teaching. For example, I might help teachers understand the concept of external cues in bridge pose for greater muscle force output in hip extension. External cues – a research-proven, superior method for cueing to enhance performance in movement – is a concept. This means, rather than a technique applied narrowly (one particular cue in bridge pose), it can be applied broadly (in cuing any pose). Concepts represent big picture knowledge that guides techniques. 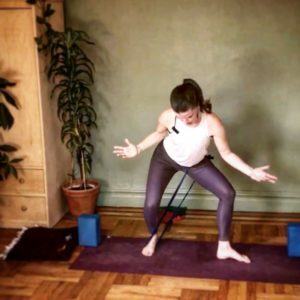 On the topic of Half Moon Pose, in this video, I illuminate a concept guiding the technique – Bands as External Ligaments in Balancing Poses. To go further with this, the constant recoil of resistance bands provides feedback in the form of joint approximation (a hugging together of joint surfaces) of the arial leg in Half Moon, as well as hip traction (a inferior glide on the hip joint) in Tree pose. Now, many smart teachers have asserted that understanding concepts (the bigger picture why) is superior to learning a bunch of techniques because concepts are the seeds that sprout techniques. When you understand a concept, you can develop techniques. This is true! And this rationale basically describes deductive reasoning. Deductive reasoning asks us to start with a general principle and then apply it to specific circumstances. For example, if I understand external cues, I can understand how to cue in any pose, not just bridge. All of this being said, I see value in just teaching techniques, even absent of concepts to explain them (again, initially.) And I think that when we learn a bunch of techniques and spend some time with them (so important! ), we start to see how they paint a bigger conceptual picture. We might arrive at an understanding of these bigger picture concepts more organically, through lived experience. This manner of learning is what’s known as inductive reasoning, or observing specific instances and their outcomes to formulate a general conclusion. For me, at least, inductive learning has lead me to a deeper understanding of what-how-why I’m doing what I’m doing. It might take more time, but ultimately, I feel like I have greater ownership over my knowledge when I’ve spent time applying it, reflecting on it and watching the outcomes for myself. It’s a more painful learning process, though, because it involves some trial and error. For this reason, I think a lot of people would rather be given ‘answers’ couched in ‘right and wrong’ type language right off the bat. This black-and-white gratification can help us feel like we aren’t making mistakes when we initially really have no idea what we’re doing. And you know what, there’s value in this too. But it’s limited. Anything pertaining to the body is far more complex than right and wrong, so eventually we need to move beyond dichotomous thinking. Here I’m teaching my signature Body of Knowledge™ Anatomy and Biomechanics Workshop series in Dubai. Additionally, as movement teachers, I think it’s essential that we understand the human body to the degree we are able to because this is the territory we work in and on. And my opinion is that the truest benefit of studying anatomy and biomechanics is again, not to gain concrete answers (there are very few if any! ), but rather to begin to humble ourselves to just how many questions deep study of the body raises. This prepares us to better recognize narrow-minded approaches to movement, untrue, dogmatic and misapplied beliefs about the body, and avoid “thought viruses” that spread like, well, viruses. When we can avoid narrow-mindedness, we necessarily adopt open-mindedness. Critical thinking thrives in an open mind. Ultimately, understanding (or getting curious about) the territory asks us to look beyond what we want to teach (our agenda) or what we think we know (our current understandings) and instead become active, willing observers of our subject matter, whether that be science, our students, or our art. In this way, we can allow this subject matter to continuously change us. 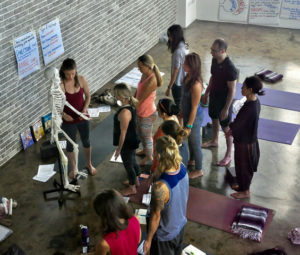 Check out my events page for upcoming Yoga with Resistance Bands and Body of Knowledge Anatomy and Biomechanics in-person workshops. You can check out my store for online Yoga with Resistance Bands classes.